It's time for another Gifted Gorgeousness update. This stitch-along, hosted by Jo of Serendipitous Stitching, is for projects that in some way have been gifted -or- are being stitched to be given as gifts. Today I am super happy to have a finish to show! 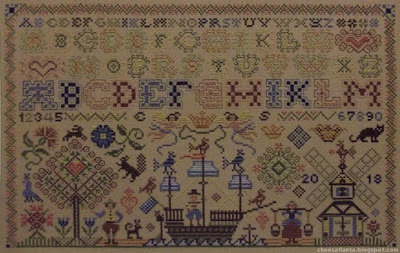 I finished stitching "Dutch Sampler" by Sandy Orton just this morning. 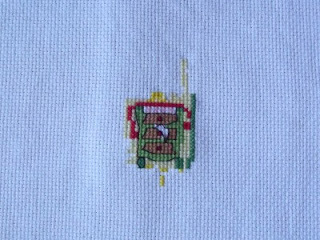 This was a fun stitch with Algerian eyelets and double running stitch, both of which were new to me. I stitched on mushroom colored 28 ct evenweave, which along with the threads, was gifted to me. The chart can be found in Better Homes and Gardens "Treasures in Needlework" magazine from Fall 1992. 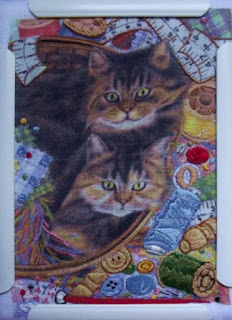 I worked a bit on "Creative Cats" which was a kit gifted to me in the late 90's. This is a printed piece, which is embellished with many stitches, such as satin stitch, stem stitch, straight stitch, lazy daisies and French knots. Every time I think I am closer to finishing, I find another area that I missed. I still have quite a bit of stitching to do ... but this project is moving along. I have also been stitching on my Christmas sampler. The chart is from Cross Stitcher Magazine (Nov 2017), which was gifted to me last year. I hope to finish this one by Christmas. Last but not least ... 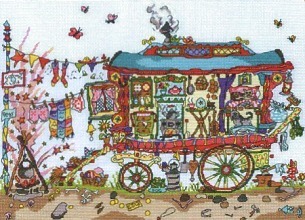 I have started stitching Bothy Threads "Cut Thru' Gypsy Wagon". A friend has nicely "loaned" the pattern to me (sort of a gift, but I must return it). lol. I have been wanting to stitch a Cut Thru' design for awhile and am too eager to wait. (I have some on my list for Santa). That's all I have right now ... I think I made great progress this month & hope to continue the trend next time. Wonderful progress on of your lovely pieces Cheryl. I love the cut-thrus and have most of them. 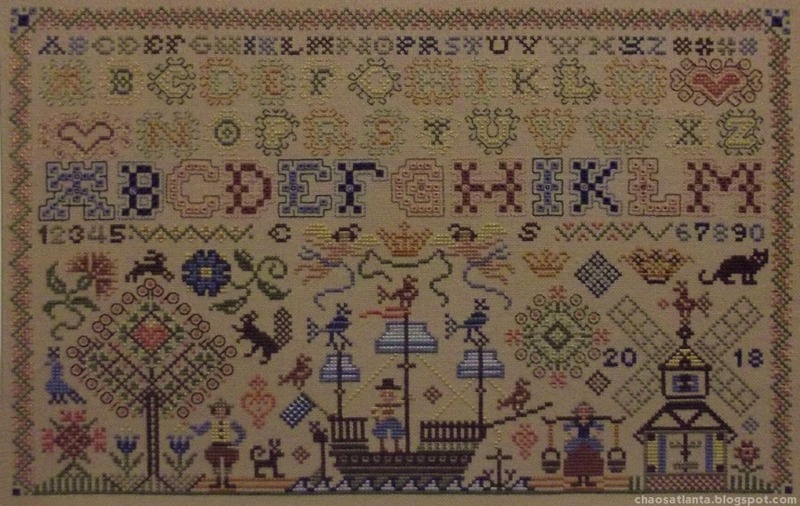 Thanks for taking part in GG this month and congratulations on the Happy Dance for the Dutch Sampler, it's gorgeous! Nice new start on the Cut Thru and a wise decision to backstitch as you go! Oh I love the Dutch sampler. Congrats for finishing it. Also it is great to see someone else stitching from mags too. AriadnefromGreece! Oh wow, your finish is so lovely! That will look wonderful when framed. Sweet cats, and nice progress on Christmas. That wagon looks like fun and will certainly keep you busy! I am self employed with Etsy and a few online affiliate programs. I get bored pretty easily and have a lot of creative hobbies. I have a habit of making friends with alley cats.